Is Remembrance only for older veterans? A new Royal British Legion Poppy Appeal campaign was launched in London on Thursday, designed to challenge common associations of Remembrance with only World War One and Two veterans. But what did former service personnel, and the members of the public the video installation is aimed at, think of it? The chilly October air was probably partly responsible for the small numbers of people who filled Paternoster Square - but if anything, it made the stark black columns rising from the middle of the square demand attention even more. As the sound of the voices in the video called across the space, small groups of all ages began to weave their way through the columns to read each of the veterans' stories. Some of those there admitted they didn't realise their perceptions of Remembrance might be skewed, but many had positive opinions of the campaign. Claire Baker and Danielle Felton, both 24, from Crewe in Cheshire, agreed they do "initially think of Remembrance as something to do with the older generation". Danielle said: "You almost forget about the younger veterans but then you see them around - and we have friends in the military as well. "It just seems to be a bit of an afterthought sometimes." Both women thought the campaign's message was important and effective. Claire said: "When most people see an older veteran, they have more respect for them and pay attention because they're an older generation. "If you heard them tell a story you'd naturally think it was about them, so it's a good way to express that message." "It's definitely still important to mark Remembrance - 100%," Danielle added. However, John Bradford, 85, from Stepney Green in London, said: "I don't think in terms of older or younger ex-service people really. "Remembrance is for all ex-service people and has got broader and broader really - for everyone who died fighting in wars, not just one lot," he said. John said there are so many different Remembrance events that he wasn't sure whether campaign money would be better spent on providing more help. "Whether this campaign will make any difference, I can't say - it probably will affect at least some people though," he said. "I think most of the parades are all the old veterans, so people think the poppy is for them," said Ken Nash, one young veteran whom the Royal British Legion has helped. The 40-year-old from Catterick in North Yorkshire was left with post traumatic stress disorder (PTSD) in 2004 after the tank he was in in Iraq was hit by 18 rocket-propelled grenades during a four-hour attack. 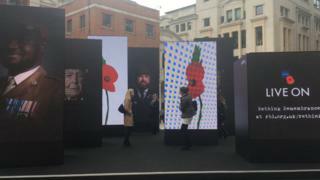 Image caption Ken Nash said: "Remembrance is very much for the younger generation as well; the guys who have been in Afghanistan or Iraq and their families too"
"The new display in London is absolutely brilliant," he said. "The way you have the old veterans doing the talking but it's actually the younger guys' stories they're telling, it's amazing. "Remembrance is very much for the younger generation as well; the guys who have been in Afghanistan or Iraq and their families too - it's the wider picture and there's loads of help there." Asked about his own experiences, Ken said: "Up until November 2015 I wouldn't admit to anyone I had an issue and it was only through getting involved with the Legion that I realised I needed to move on because I'd been living in a caravan for two years. "The RBL funded through the rent and bond scheme to get me into a flat, so I feel a lot more secure than the caravan. "My daughter is 15 and she will now come and stay when she wouldn't really stay before, and the Legion funded a sofa bed for me so she has somewhere to sleep." Ken describes himself as an "amateur artist" and added that now, when he wakes up from a PTSD nightmare, he just gets out his charcoals and starts drawing. And what does the campaign mean for 92-year-old veteran Geoffrey Pattinson, who stars in one of the videos? "We tend to not think about the conflicts that have gone on since, for example, World War Two, so it's nice to know that the Royal British Legion have opened our eyes to the fact that the young people of today also served, from Iraq to Afghanistan and Aden," he said. Image caption Geoffrey said it was positive that "younger people are going to be involved and thought about"
Geoffrey was a Sergeant with 9th Battalion The Parachute Regiment during World War Two and was injured after taking part in D-Day. "On day four I got injured - I was hit in the back of the legs by machine gun fire. Not too bad, but I couldn't move... so I was evacuated back to England. "I had to serve on as I was a young soldier, but when I came out in 1947 I went back to my old job in Glasgow and then I moved with my wife to London, and I found it difficult," he said. "At that time I didn't realise that I probably could have asked for help as a young veteran. I didn't go and find anything out and just fended for myself." He said this year's focus for the Poppy Appeal was crucial to changing the way people thought of Remembrance, and added: "Through this, the younger people are going to be involved and thought about, and it's important we do think about all veterans whatever branch of the service they're in and however old they are. "I think the campaign's message will be very effective, and hopefully with the amount of media attention it's received it will be seen and make people think about veterans as a whole."